Mama has been home with the flu for two days. I feel bad for her, but secretly, I am not complaining. Though I’m missing out on my walks, we have at least compensated for that with lots of extra cuddle time. So I quickly designated myself chief nurse practitioner. I cleared the bedroom of any other humans and beasties (no Cato, no arguments, heh, heh) to quarantine my sickie. And I have been ministering tirelessly for my patient both night and day. My secret? 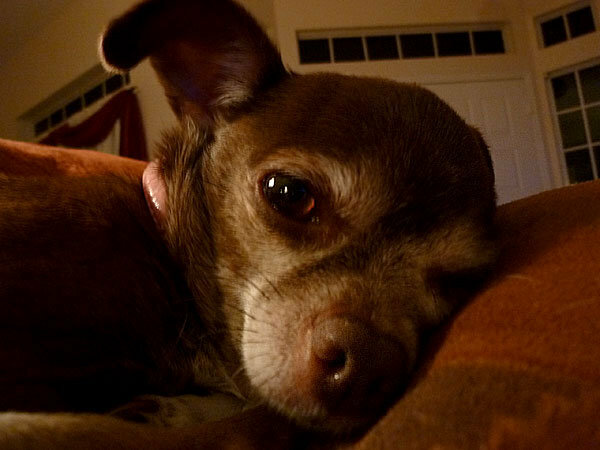 Chihuahua love “soup,” an old family recipe that has been handed down many generations. I like to serve this liberally. It is MUY good for you! Hourly dose of nose licks – If nose is runny (ick! ), this can be substituted for chin licks. No need to get gross. Naturally “heated” blanket – No need for electricity! Carefully arrange covers over the patient, resisting any feeble resistance – fever can make the humans a little delirious. Carefully positions self over patient’s lap. Do hourly rounds to evenly distribute heat over feet, tummy, chest, and head. Bedtime stories – The long hours of bed rest can grow tiresome for all. Should you take a little nappy while on duty, be quite animated in your dream interpretations — lots of wiggles, snorting, whining, and pawing in the air. Makes the humans laugh and we all know happiness is the best medicine. Many looks of intense concern focused on patient’s forehead – The Power of the mind, as I have explained before, is infinite! Modified game of fetch – When you are a small chica or chico, this can be safely accomplished within the confines of any queen-sized bed. Select a small, soft toy and smuggle it onto the bed. When the human’s eyelids start to flutter open, carefully place the toy in front of the patient’s line of vision coupled with the sweetest “begging” look you can muster. Don’t press the patient if they are not up to it too soon. But be gently persistent as eventually this activity is sure to lift the spirits, particularly when sprinkled with lots of Chihuahua spice – the secret ingredient. Mom has “liked” the Dalai Lama’s fan page on facebook. So every day we get a bit of wisdom with our morning coffee. The Dalai seems like a rather insightful human. He has a lot of good inspirations to share and oodles of compassion. I really like his thinking. And it occurred to me, with all due respect to his Holiness, that with me being such an enlightened Chica, he and I might have a very interesting meeting. After all, much wisdom in life does come from the littlest creatures. I’d like to talk about some of the challenges we face in this life. For me there are a few persistent trials – height issues, well, general size impairment gets in the way of some goals. Then there is the “being too cute for anyone to take me seriously.” Yes, yes, I know. It doesn’t seem like much of a dilemma, but trust me, coupled with that height issue, it makes for a tough time establishing authority ’round here. And last, but NOT least, the most difficult issue is my inability to speak to the humans. I’ve tried the deep, silent but significant stare – that usually gets me mixed results. They know I’m trying to tell them something but they don’t understand what. I’ve tried the happy, bouncy lead-them-to-the-point maneuvers – that one works sometimes, but it can be exhausting. Humans just don’t seem to have much focus. They are just too busy. I’ve even been known to employ telepathy. It puts them under my control alright, but they seem to get stuck in the “waiting for orders” mode and I can’t get very far with them. Seriously, how hard is it to understand that the Chihuahua is a good girl and deserves a treat. Whatever! Don’t get me wrong, I love my people. But I wonder if the Dalai finds humans as dense and frustrating at times. And if I can’t get them to get me a treat, I’m not sure how I’ll explain that I’d like to pay the Dalai a visit. Seems something might get lost in the translation. So for now, I guess facebook will have to do. Maybe he’ll friend me once he hears about my nuggets of wisdom. I have one of those fan pages too, you know with pictures and tons of good musings. So how about if I start sharing a thought of the day here in the blog. Surely one or two of them gems will be worth noting. And while Mom has to work I have plenty of time to nap, I mean meditate, right, meditate. I’d add an extra day to the weekend for family time. Weekends are generally too busy and too short. ‘Nough said! I believe if we all tried to spend a at least a little time each day thinking of change for the good, we could make a big difference. Peace be with you, Amigos! 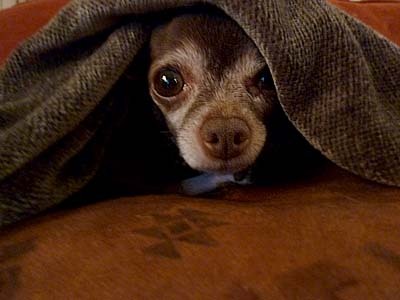 You are currently browsing entries tagged with Human at Chihuahua Wisdom Blog.